Lake Baikal is listed as a UNESCO World Heritage site and was also voted as one of Russia’s Seven Wonders. It’s not hard to see why. The wooden boat gently rocks on the waves. Overhead is a perfect azure sky broken only by the sculpted wings of swallows. Peering over the side of the boat, I can see through 120ft of crystal-clear water, which then runs into a darkness teeming with fish and rare plants. You could be forgiven for thinking you were out at sea – if it were not for the conspicuous lack of a salty tang in the air. Siberians believe that Lake Baikal’s water has curative properties, and habitually call it “the freshwater sea”. It is rich in oxygen, and as pure as distilled water. But in winter, its surface becomes like heavy-duty safety glass. So thick is the ice when the lake freezes that during the Russo-Japanese war of 1904, railway lines were laid over it which successfully supported 65 steam engines and 2,300 loaded wagons. The ice takes on a turquoise hue in spring as it breaks and disperses to reveal the shimmering water once again. Lake Baikal is at the very heart of Asia, on roughly the same latitude as Moscow and London. It is located 445 metres (1,460 feet) above sea level, while the lake bottom descends to almost 1,200 metres (3,937 feet) below sea level. Locked within the massif of the Baikal Mountains, from north to south the lake runs for 636 kilometres (395 miles) – the distance between Moscow and St Petersburg. The lake is so big – its surface area is as large as Belgium – that it would take around four months, at normal walking speed, to walk all the way around it. Baikal is a world of its own, like nothing else on Earth, populated by an estimated 2,600 species of plants, animals, and microorganisms – two thirds of which cannot be found in any other body of water on the planet. Baikal’s weather is rather unpredictable. It can change within an hour. The Verkhovik (the local name for the north wind) blows across the lake from the River Angara valley, a sign that warmer weather is on its way to the northern bank. But, while the north shore is bathed in sunshine, when the Verkhovik is blowing, there will be storms in the south of the lake. When this happens, the cliffs are lashed by 12 feet waves, and brown bears abandon the shore to take refuge in the pinewood forests. Yet the Baikal region is one of the sunniest in the whole of Russia. The lakeside village of Bolshoe Goloustnoe, for example, clocks up 2,583 hours of sunshine a year. Geophysicists estimate that Baikal was formed approximately 25-30 million years ago, making it the world’s oldest lake. But scientists have found no signs that the lake is deteriorating with age, which leads them to hypothesise that Baikal is a nascent ocean. It is located in a vast crustal fault basin that continues to grow around 2 centimeters (1 inch) every year, like similar lakes on the African or South American continents. If all the rivers on Earth were to flow into Baikal, it would take a year to fill it. The extraordinary size and unique features of this sea-lake have inspired many Russian writers, artists, filmmakers and poets. 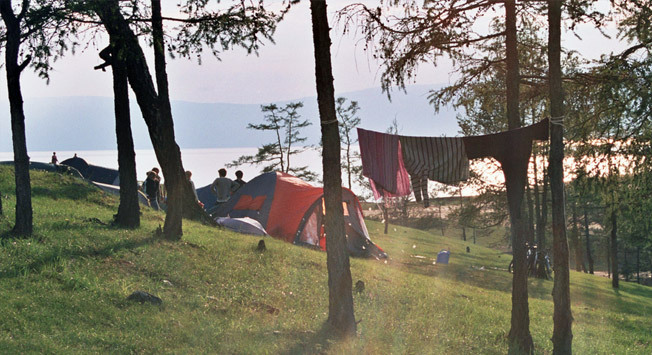 Writer Valentin Rasputin wrote in his monograph on Baikal: “It seems that Baikal should overwhelm people with its gigantic size and scope. Everything about it is on a gigantic scale, expansive and mysterious. Other creative minds inspired by Lake Baikal include playwright Anton Chekhov, artist Nicholas Roerich and Hollywood producer-director James Cameron. Cameron came to Baikal not only in search of inspiration, but also to help form the scientific detail for Titanic and Avatar. On his most recent trip, Cameron went to the lake bed in the Mir-1 bathyscaphe (a deep submergence vehicle), with a team of scientific researchers.